Last month, we had started our discussion of storage systems by looking at various concepts like SAN, NAS, etc. In this column, we will look at the concept of scale-up vs. scale-out storage, and discuss their relative advantages and disadvantages. Most of us are familiar with the concepts of scale up and scale-out computing as they apply to server computing. A scale-up server is a single system with high CPU power and huge memory, and hence is able to handle increasing workloads. As the load on the system increases, it can be scaled up by adding more CPUs, more memory and storage to the single system, which is typically a shared memory system. The work is usually done by multiple threads and processes running on the same system, and they typically communicate through shared memory. This is a ‘shared-everything’ system. On the other hand, scale-out computing is when multiple nodes are part of the system, and they all act together to handle the workload, which is typically partitioned across the nodes. There is usually no shared memory across the nodes – they communicate through explicit messages over the network. Each node has both processing and storage elements. This is normally a ‘shared nothing’ approach, where the nodes interact in a loosely coupled manner. The scale-out system can be scaled up to handle additional loads by adding more nodes to it; the work can be distributed across newly added nodes transparently, without the need to bring down the system. 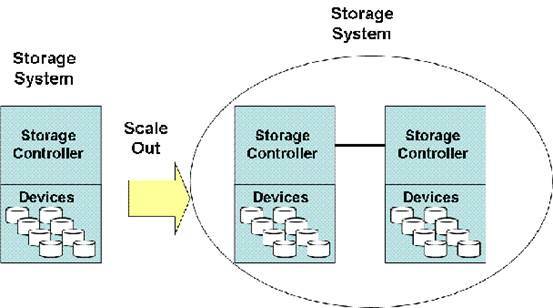 Now, scale-out and scale-up storage systems have the same conceptual difference. In a scale-up storage system, you add more and more storage capacity to the single storage node to meet increasing storage requirements. This can be achieved by adding many individual disk drives to a storage controller (or a pair of storage controllers so as to ensure failover and high availability). Since the storage capacity (i.e., number of individual disk drives) that a storage controller can support is limited, if storage requirements exceed that capacity, the only option is to move to the next bigger controller, with a higher capacity. With scale-out storage, this problem is avoided, since each node has its own storage controller, and as you add more nodes to meet increasing storage demands, it allows the controller architecture to grow as well. Scale-out storage is typically marketed under the slogan, “Pay as you grow”, since it allows you to add nodes as and when your storage requirements increase, instead of having to over-provision from the beginning itself. How do scale-up and scale-out storage systems compare in terms of performance? 3. Average latency of an operation. The IO request latency is limited by a number of factors, including the physical factors associated with the storage system. Let us consider a trivial example where the storage system is the traditional hard disk. Here the IO latency is limited by the rotational delay of the disk, the seek time of the disk and data transfer latency. The rotational delay is governed by the disk’s rotational speed, which is expressed in Revolutions Per Minute (RPM) and indicates the amount of time it takes to get the right sector under the disk head. The seek time is governed by the time it takes for the disk head to position itself on the right track on the disk. Once the disk head is in the right position, it can start reading/writing the data. The delay incurred in reading/writing the data is the data transfer latency. All these three components contribute to the IO request latency. Depending on the purpose of the storage system, any or all of these performance measures would be significant. For instance, if you are using the storage system for backup/archival purposes, you may be more concerned with overall IO throughput rather than the individual IO request latency. On the other hand, if the purpose is to serve data to a latency-sensitive/client facing application such as a database, IO request latency would become a significant measure of performance for the storage system under consideration. Hence, different performance measures are applicable for different workloads being deployed on the storage system. Coming back to comparing scale-out storage and scale-up storage, each has its own performance benefits. Scale-up storage can offer good IO request latencies, while scale-out can offer good IO throughputs. Since scale-out storage is a distributed system, it can suffer from greater communication costs incurred between the nodes. For instance, consider a distributed file system supported on scale-out storage. Both the data and the meta-data associated with each file can be distributed over different nodes on the storage system. For instance, consider a simple example where you are trying to access a file ‘/dir1/file1’. It is possible that dir1 is located on node1 and file1 is located on node2. Hence, the file access operation spans multiple nodes in the scale-out storage system, which leads to greater communication costs and a longer request latency. Here is a question for our readers to think about. Given that the file access operation can span multiple nodes as in the example mentioned earlier, let us assume that we are trying to delete the file located at ‘/dir1/file1’ in this example. This operation spans two nodes. How can we ensure that the operation is atomic, even if one of the nodes fails while the operation is in progress?